I like very much the guest suite! The UXEMOTOR is looking very good, i can never get a shine like that on my worktops and cabinets, i do have 2 questions though, from someone with no nautical knowledge at all, are the ballast tanks large enough to compensate for low levels in the fresh water tanks? and i see no handrail for the steps, ok on rivers and such but anything tidal could be an issue. The LUXEMOTOR is looking very good, i can never get a shine like that on my worktops and cabinets, i do have 2 questions though, from someone with no nautical knowledge at all, are the ballast tanks large enough to compensate for low levels in the fresh water tanks? and i see no handrail for the steps, ok on rivers and such but anything tidal could be an issue. The ballast tanks are only for adjusting the draft and the air draft. For freshwater there are 2 large slow sand filter systems which can satisfy my thirst easily. Of corse, the slow sand filters do not work with salt water and therefore I have a big freshwater tank of about 2000l which I would have to refill at marinas if longer salt water trips are planned. - For channels with locks and narrow marinas an external handrail is unusable because the handling would be too cumbersome. Here you need an internal handrail which is usually mounted directly on the superstructure. - For lakes and coastal waters or large rivers with larger waves, however, the outer handrail would be extremely much safer. For the sake of better space utilization I have left the gangboard almost on the whole ship and therefore I have almost no superstructures where I could mount an internal handrail. The LUXEMOTOR was clearly designed primarily for inland waterways, so an external handrail would be counterproductive. Do you recognize my dilemma? Would something like this be any good to you? Should be easy to tweak to suit the size you need. Thanks Mike, but I am looking for textures only. They have to be seamless and frameless and black or deep dark grey colored. 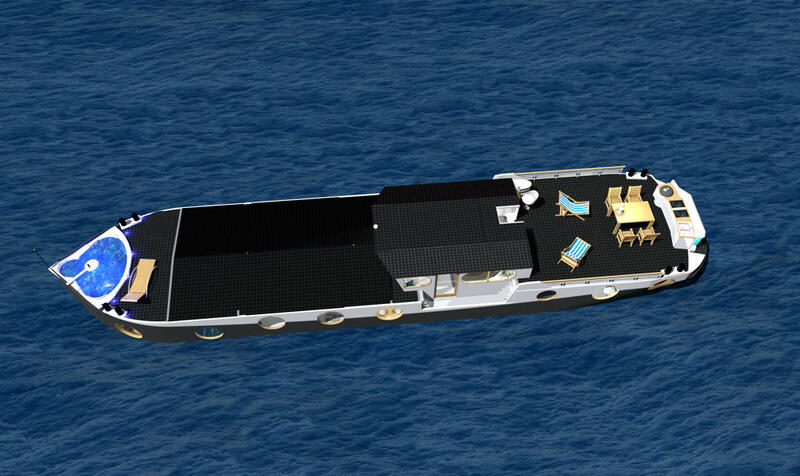 And I'm not shure if it's the resolution of the texture, but my rendering looks more like there are rubber mats on the boat than solar cells. Just a tip about solar panels. For maximum performance, it is mandatory that the exposure is optimal. But I see that there are panels on the ground, ERROR! The slightest shadow on a small part of the surface (chairs, table, ...) reduces the total power. It is therefore necessary to put panels on the roofs and not on the floor (front and rear). Thanks Hans, but as allways if I find a potentially texture it is not free and way too expensive!